Just months after her second child died in a freak accident, Kijivu the gorilla cuddles up to her newborn infant. 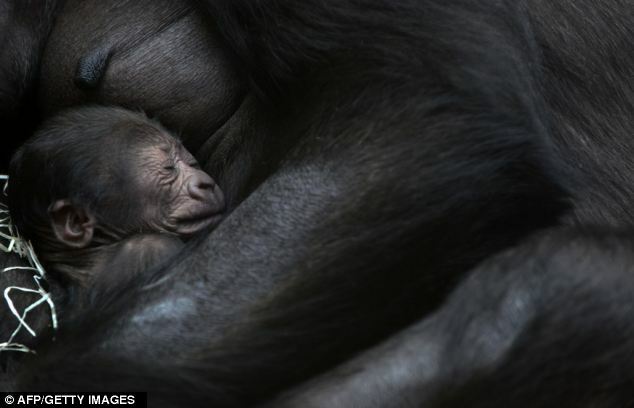 At just two days old the tiny baby looks curiously around his new home at Prague Zoo yesterday, his 19-year-old mother takes a well-earned rest. The birth of any rare Western lowland gorilla in captivity is a cause for celebration but staff at the zoo are especially excited as the new arrival comes after one of the most tragic events in its history. Kijivu's second infant, five-year-old Tatu, accidentally hanged himself with a climbing rope. The young male was found dead in July with the rope around his neck in a sleeping room. Female gorilla Kamba - another of Prague Zoo's gorilla group - was by Tatu's side when he was found and was apparently trying to help him. At the time zoo director Miroslav Bobek said the death of Tatu - whose birth in 2007 was watched by tens of thousands of people online - was the most tragic event at the zoo since flooding in 2002 killed more than 100 animals. 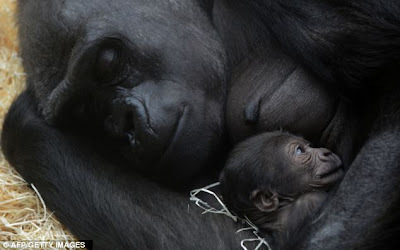 But this week staff have something to celebrate and the beautiful pictures reveal the special bond between mother and baby as Kijivu gently cradles her newborn. Ceske Noviny quoted zoo spokesman Michal Stastny as saying the birth on Friday was quick and both mother and baby were fine and remained in the gorilla group. 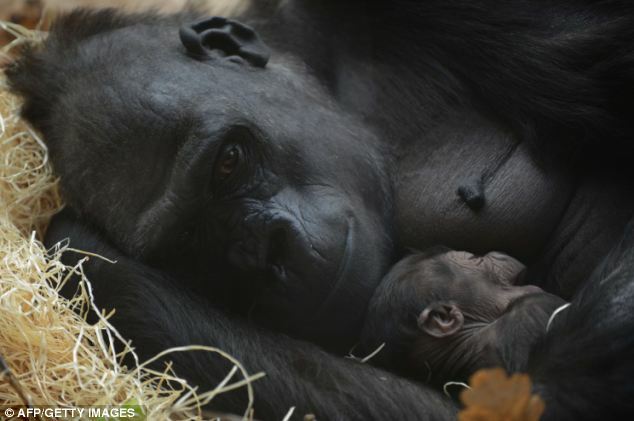 Kijivu has now given birth to four infants fathered by Prague Zoo male Richard. She gave birth to her first, Moja, in 2004 and Tatu in 2007. She also had a male named Kiburi in 2010. Moja, seven, has since been transported to a zoo in Spain. The Prague group of gorillas also includes three other females - Kamba, Shinda and Bikira. Zoo staff are anxiously preparing for another expected arrival. The most senior female at the zoo called Kamba is heavily pregnancy even though, at 40 years old, she was believed she was past reproductive age. She is expected to give birth next year and keepers say it there is a large risk of complications. 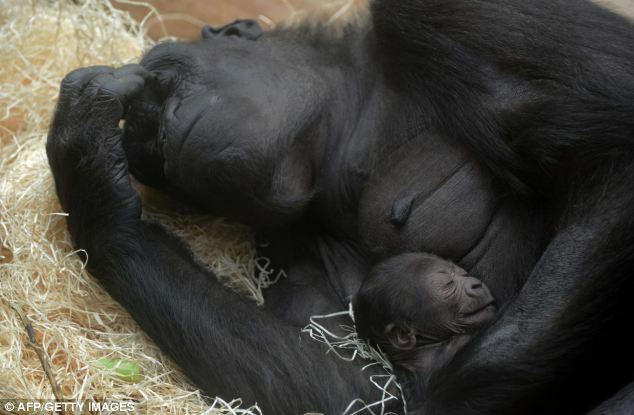 According to Prague Zoo, Kamba was born in the early 1970s in Cameroon's tropical forests. She became pregnant in 2007 but the infant died and the adult also nearly lost her life in the process.